Central Bark Package – While you’re away, get something extra special for your dog. 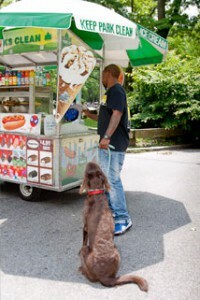 The Central Bark Package is a half hour private walk with one of our counselors, complete with a NYC hot dog! Any dog staying for 7 nights or more is eligible for a complimentary bath in our spa OR 25% off a full groom. Each dog is unique. At Camp Canine, we understand each guest may require different accommodations or care based on breed, age, personality or special needs. Please discuss any special requests with us when you make your reservation and we’ll be happy to make your pet’s stay exceptional. LOVE Camp Canine!! Whether my Golden Retriever Bode is dropping in for a play day or staying the night, I know he's having a great time. 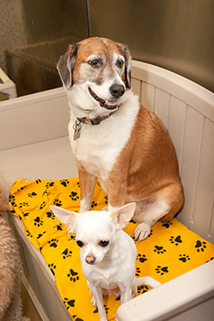 I'm very particular with Bode's care and am 100% confident and comfortable with the entire staff at Camp Canine. When I travel, I can get updates and talk to the person(s) taking care of Bode at any given time. It's so great to have one less thing to worry about during my hectic day. Also, any day Bode spends at Camp Canine is a great day for Bode. When I drop him off, he doesn't even look back at me. He's so excited to see his dog and human friends. When I pick him up at night, he's completely exhausted and snores. I love my dog and I want him in the best hands possible. That's why I take Bode to Camp Canine. I want to thank Camp Canine for taking such good care of my Daisy. They have been grooming her for years and I left her for a Valentine's Day party, but this was the first time I boarded her. Being a rescue, she has separation anxiety and I worried about leaving her. Well, she came home pooped out, happy and relaxed! I shouldn't have been surprised because I live right next door and every day I see how happy the dogs are as they leave camp. All of the employees there are wonderful and dedicated to the well-being of the dogs. Next time I will have no worries at all of leaving Daisy at Camp Canine. Thank you!!! Camp Canine is fantastic and Tania and the staff really made the experience great for my wife and I and most importantly our English Bulldog. We boarded him at Camp Canine for a few days during our wedding weekend and couldn't have been happier with the experience. They took great care of him! Mention this offer to receive discount. First time Camp Canine clients only. Subject to availability & limited to non-peak periods. Cannot be combined with any other offers. 7 day maximum. Must be used during one stay.